Eager to use your Tuglyfe 7.6W Ultra Portable Pod System, but the pods are not working like they used to? Well, thank Augvape for allowing you to purchase new pods so that your vape juices can be tasty like they used to be. If you are familiar with these pods, you will know that they have a 2ml pod capacity. This is kind of a lot when you think about it because most pods cannot even hold 1ml for you. 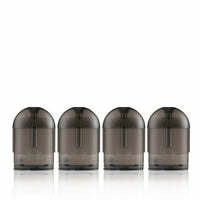 However, if it is not enough, the bottom fill design of the pod will make it possible for you to quickly get a refill. The silicone stopper on the pod will let your pod be anti-leak in order to prevent you from making any big messes when you vape. One of the best parts is that this pod is able to work with vape juices that contain salt based nicotine so you can enjoy the intensity that you need. The coil resistance will be 2.0ohm, and the pod is also magnetic so that it can easily connect to your pod mod. You can purchase the pack of four pods so that you do not have to purchase new ones anytime soon.